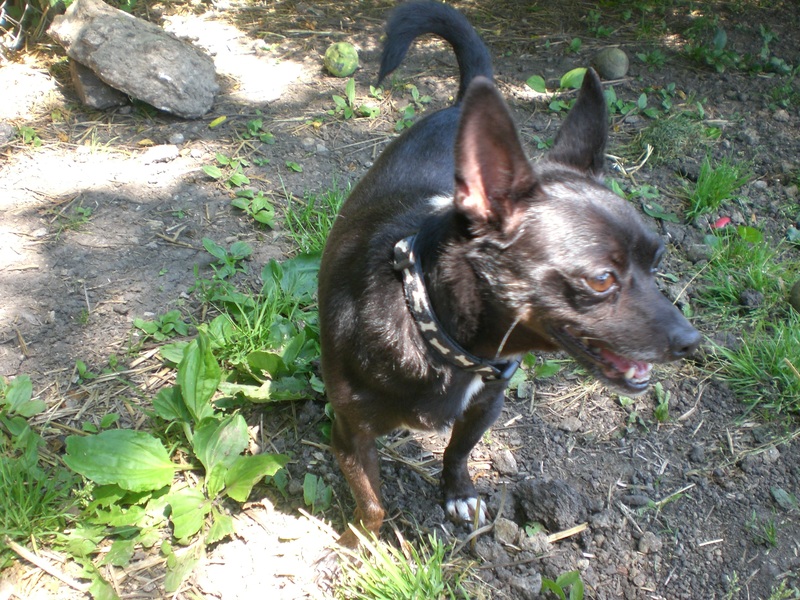 If you’re looking to add a Chihuahua (or several!) to your family, Orphans of the Storm® is definitely the place to look. There are some newer arrivals who don’t want to get too used to living in a kennel and are hoping to find their forever home soon! 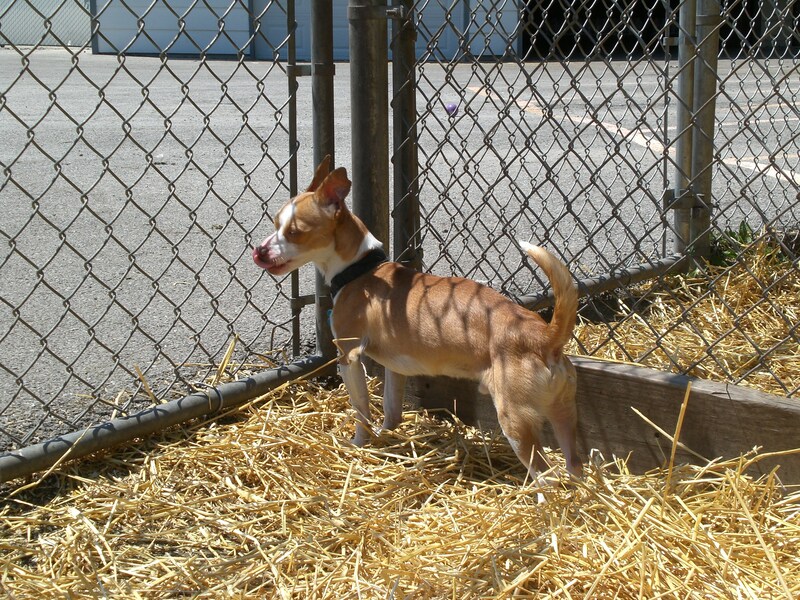 Clay the two-year-old Chihuahua mix was snoozing in the sun when I first walked by his kennel, but when I showed up again with a leash he was ready to go! He has cute white and brown markings, and his forehead gets wrinkles on it when his ears perk straight up and he’s watching something attentively. Clay may have little legs, but he can move quickly! He scurried around the run and always went to the fence to investigate if there were people, dogs, or moving cars on the other side. Although he isn’t quite the size to make a good guard dog, he seems to have potential to at least be a good alert dog. After romping around in the sun for a while, Clay decided it was time to find some shade. He plopped down next to one of the trees inside the run and I joined him so I could scratch his head and give him a belly rub (and enjoy some shade myself). 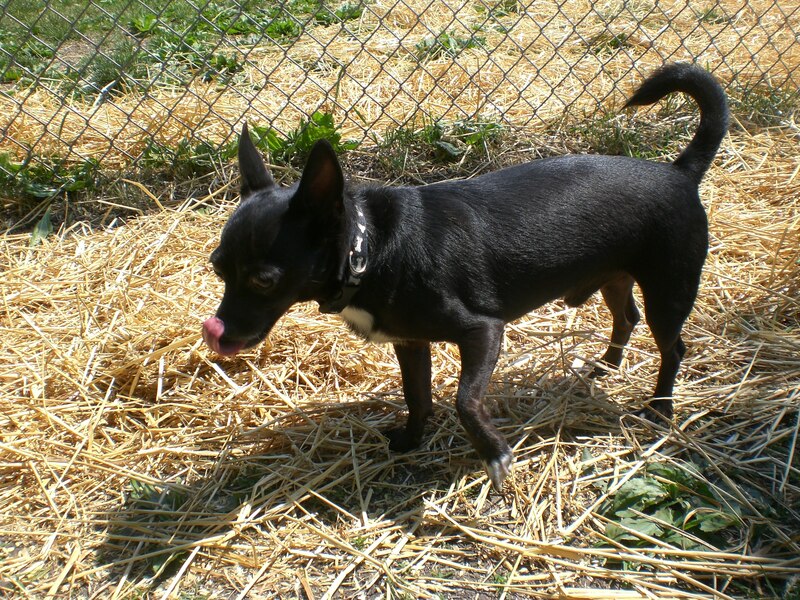 He’s a friendly little dog who would love to get to know you! 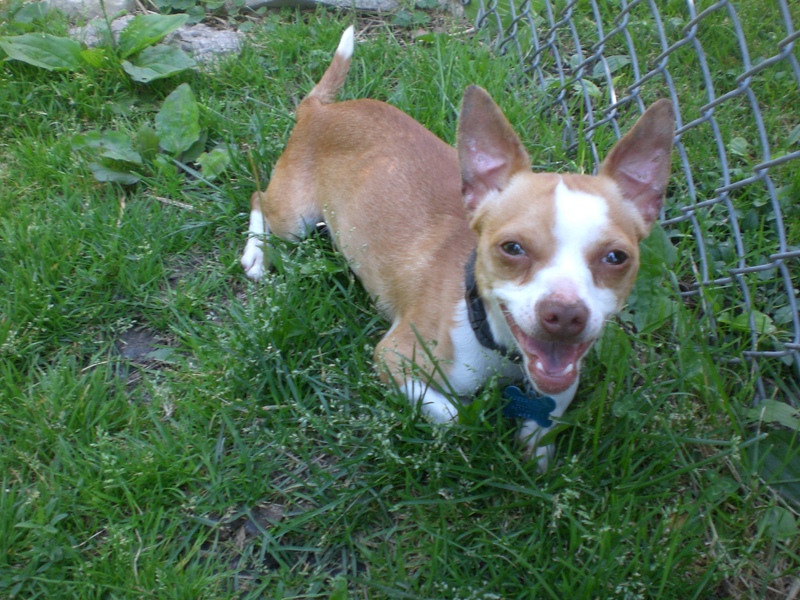 Jax is a seven-year-old Chihuahua mix who was ready to stretch his little legs. We made our way to the run and I let Jax explore. The runs recently got a new layer of hay, and Jax didn’t know what to make of it. He picked his little feet up extra high when he was walking on it, which was funny to watch. I think it’s safe to say that Jax has never been on a farm. Jax was a little shy at the beginning, so I decided that I would let him make the first move and be the one to come to me when he felt comfortable. It didn’t take very long; I was sitting on the bench and he made his way over, slowly but surely. He sniffed my shoe and I reached down to scratch his neck. Jax is ready for his close-up! Jax would also come when I called him. 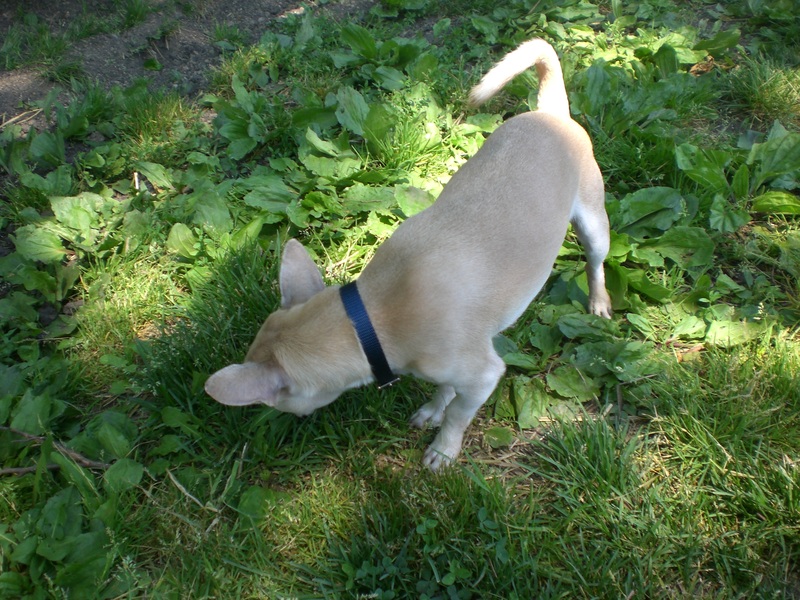 It usually involved a roundabout path, with a few stops along the way to sniff the grass, but he would eventually make his way over. With a little encouragement (and probably some treats), Jax should have that command mastered in no time. If you’re looking for a smaller, older, calmer dog, come meet Jax! Blitz the five-year-old Chihuahua is the newest of the three, and you can find him in the cages next to the front office. Blitz can be a little bark-y when he’s inside his cage, but once he was out and on the ground, he was much better. The cutest part of Blitz (in my personal opinion) is his ears! They’re so big, and they’re perched wide apart on the top of his head. It’s pretty adorable. Blitz was also a little shy at the beginning, which might be because he isn’t quite used to his surroundings yet. 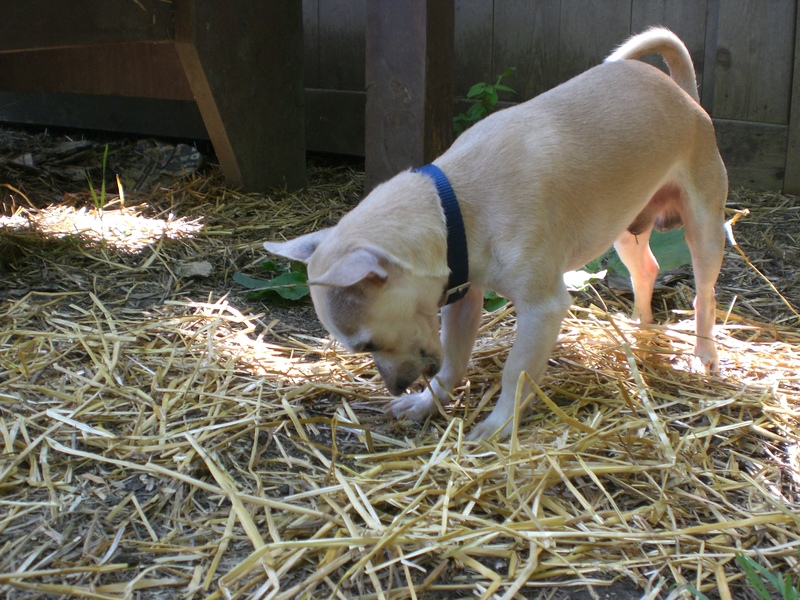 Blitz was a little more adventurous when it came to playing in the hay, though. He was digging through it and sticking his nose in it to investigate what was hiding underneath. I went up to him after a few minutes and he seemed much more comfortable, letting me pet his back and scratch those adorable ears. After that, we walked around the run together so Blitz could continue his explorations. He wasn’t such a fan of the leash when I first put it back on him, but after we walked a little bit he did very well. 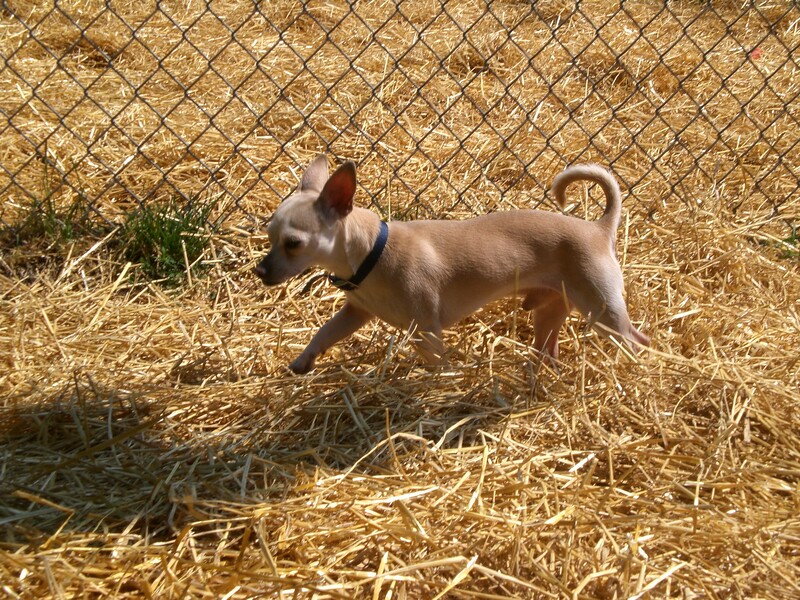 Don’t forget about some of the other Chihuahuas still waiting for their forever homes! Coco, Frito, Fumble, Puggie, and Tino are all ready to find a lap to snuggle in. 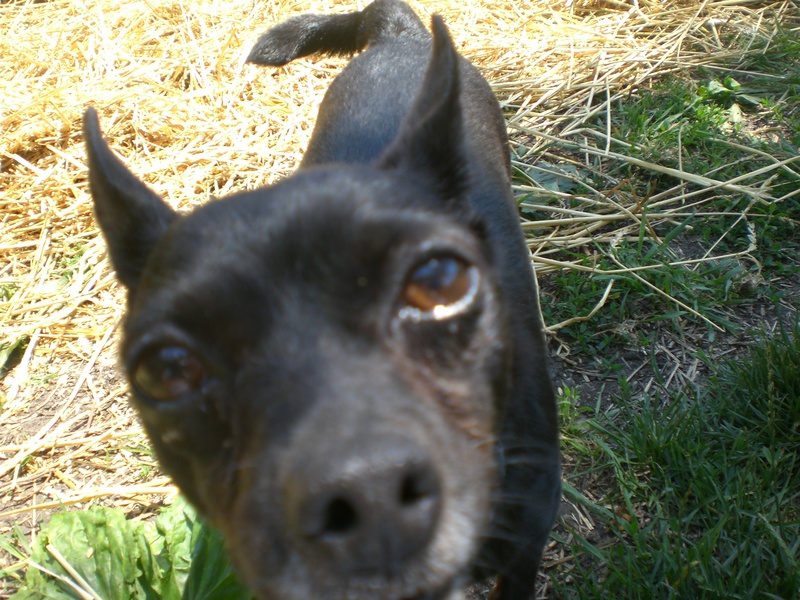 Orphans of the Storm® is the place to find the perfect Chihuahua companion for you. 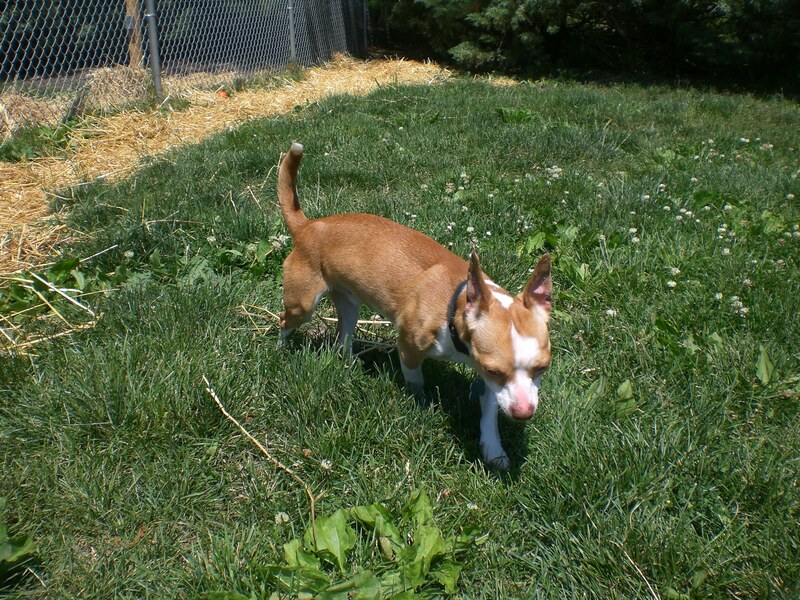 Posted by Meet the Pooches on June 10, 2012 in Dog Profiles and tagged adoption, animal shelter, Chicago, Chihuahua, dogs, Orphans of the Storm, pets. Adorable. Each and every one is just lovely. I am not familiar with Chi’s. Would certainly consider adopting though, if they get along well with our wonderful pooch! Will try and figure out out to make the Deerfield trip. Diego is a great Chi. He lived with other dogs.